Brothers Ethan and Joel Coen once again cull from their scholarly Western aesthetic, (“No Country for Old Men”, “True Grit”) gifting movie lovers another blend of imaginative, macabre brutality with skilled dialogue, hilarity and blazingly terrific performances; six vignettes, tales of post Civil War lawlessness, commencing with songster “Buster Scruggs” Tim Blake bedazzles as an innovative, erudite slayer of the lawless. Besides Blake’s incisive rendering, other depictions are worth touting: James Franco, with humorous equanimity is a beleaguered bank robber; Zoe Kazan stuns as an intrepid woman joining a covered wagon caravan, journeying to Oregon; inimitably wonderful is Harry Melling as a limbless orator, performing before meager crowds; Shakespeare and Lincoln’s Gettysburg Address are squandered on the unlettered; Tom Waits, enthralls as a lone prospector, finding gold and justice in an intractable landscape. Special plaudits go to “President Pierce” a canine who refused to be silenced. 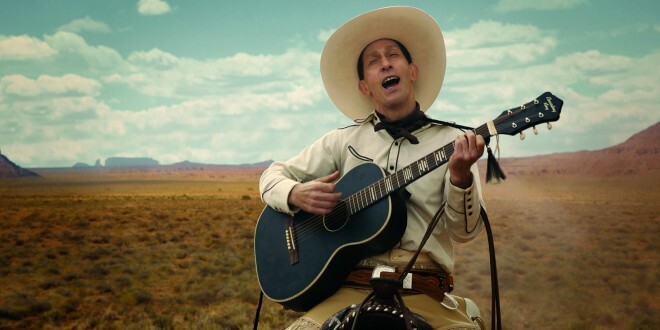 Intelligent, pristine, stilted diction elicit viewers attention; “The Ballad of Buster Scruggs” resonates with philosophical treatise: loyalty, love, righteousness, man’s obligations to his fellow man, God and an untamed cosmos.